I don’t always have much time to write reviews, but when you come across a product that you know other moms will love and find incredibly useful, I make time! I am specifically referring to a new product called Bee Balmy which is an all-purpose balm made of natural ingredients with no preservatives or petrochemicals, PLUS it’s a product that works! Ethan was born in November 2008. In 2009, at around the age of 6 months, he started having eczema on his cheeks, in the fold of his arms and behind his knees. There were days where his cheeks would weep and be so inflamed – it used to freak me out completely given it looked so sore and, some days, it was clear he was uncomfortable. I saw different doctors, including a specialised doctor from overseas. Cortisone eventually was the only way but, as some of you know, it’s not good to use long-term, so I continued searching for other options. As he has gotten older, the eczema on his cheeks and arms has disappeared, but he still has it behind his knees. Then, recently, Jake had a major rash on his cheeks. I tried everything and nothing was working – I tried some moisturising creams and lotions and nothing worked. I had no idea what was causing the rash, but it was irritating him a lot. Then, one night Sarah came to fetch her son – Ethan’s best mate – and we got chatting. She took a look at Jake and said “Why not try Bee Balmy?” (a product Sarah produces herself). So, that night I did and within 3 days, the rash was almost gone. After 5 days, it was gone! Now, I am using it on Ethan’s eczema and the eczema is getting better and better. Had I known about this product when Ethan was a baby, it could have saved me a lot of worry (and money!). I use the lotion daily on both my kids and both my hubby and I use it! Sarah’s kids also suffer from eczema and it has worked so well for her too. That being said, the product is completely natural – no colorants, preservatives or petrochemicals. Because of its ingredients (refer to ingredients list further down), it is antibacterial, so even for scratches or little uncomfortable sores. It’s perfect for everyday use on your skin too and, although I personally haven’t used it for this, it’s apparently a great help for nappy rash! I can HIGHLY recommend this product to anyone whether you’re a mom or not. It’s perfect for both you and your little ones! I have the large 150ml container (as per photo above), but the product is available in 3 sizes (150ml, 50ml and 10ml (lip balm size)). The 10ml one is perfect to pop into your handbag, baby bag or even a school backpack for use at school when your little one has a fall, gets a little “eina” or you need the teacher to use it for a nappy rash or general rash a few times in the day. Olive (Olea europaea) oil has moisturising properties and is quickly absorbed into the skin. It is packed with antioxidants to help repair cellular damage caused by the natural process of ageing. Olive oil also has a sun protection factor (SPF) of 8. Grape (Vitis vinifera) seed oil is a light, non-greasy skin oil. It has regenerative and restructuring properties, and is effective in wound, anti-ageing and acne treatments. It has mild astringent properties that help to tighten and tone the skin, and it can reduce swelling. It is rich in essential fatty acids, especially linoleic acid, which strengthens cell membranes. Its antioxidant properties also prevent pores from becoming clogged. Sweet almond (Prunus amygdalus dulcis) oil contains Vitamins A, B1, B2 and B6, and is extremely rich in Vitamins E and K, which makes it an excellent moisturiser for dry or inflamed skin. It is easily absorbed into the skin and has an SPF of 5. Jojoba (Simmondsia chinensis) oil is a very light, non-greasy oil with anti-inflammatory properties. It has a similar molecular structure to sebum, the oil which the skin naturally produces, and is effective in acne treatments as it dissolves the sebum clogging the skin’s pores. It has an SPF of 4. Apricot (Prunus armeniaca) kernel oil is rich in antioxidants, and Vitamins A and E. It hydrates and nourishes the skin and is easily absorbed. Lavender (Lavandula angustifolia) flowers contain anti-inflammatory and antioxidant properties, reducing skin itching and redness. This herb has a soothing scent and promotes a sense of calm. Calendula (Calendula officinalis) flowers, also known as marigold, are renowned for their healing and detoxifying effects. This herb is particularly effective in treating rashes, fungal infections and burns. 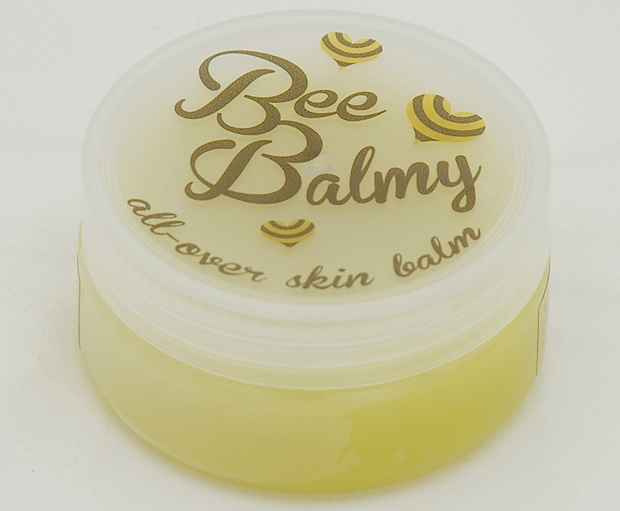 Beeswax (Cera alba) has natural barrier properties, and is moisturising and healing. It is non-allergenic and anti-inflammatory and contains antioxidants. Sarah is still working on her website, but should you be interested in finding out more about the product or would be interested in getting some for you and/or your children, please find all her contact info below and get in touch! My daughter has had eczema since she was born and it is a constant struggle . Where can I purchase Bee Balmy ?